The turkey fryer pot is specially designed for frying whole turkeys. It’s tall and narrow design requires less cooking oil than a standard stockpot. The frying basket or perforated turkey rack ensures even frying as the cooking oil is able to circulate all around the bird. Since the turkey is not sitting on the bottom of the pot, the bird’s bottom doesn’t get scorched. You can lower and raise the bird safely using the lifting hook. Compared to roasting the bird in your oven, deep frying it is very much faster. Estimate about 3.5 minutes per pound of turkey. For an 18 pound turkey, it’ll take about 60 minutes for it to be properly cooked. As for turkey breast, estimate about 5 minutes per pound at 350°F. A single chicken will take about 18 minutes for it to be fully cooked. Estimate about 7 minutes per pound of chicken deep frying at 350°F. 1.1 What size turkey will a 30 qt fryer hold? 2 What Can You Cook In A 30 qt Turkey Fryer? You need the proper tools to fry a turkey safely. Lowering and lifting the turkey into the hot oil has to be done slowly and carefully. Some packages come with a frying basket included while some come with a burner stand instead. Some come with a battery operated safety shut-off timer that shuts off the gas after every 15 minutes. You’ll need to reset the timer every 15 minutes. Besides deep frying turkey, you can also cook fried chicken, fish, fries, hush puppies etc. You can also boil seafood, lobsters, crawfish, corn on the cob, vegetables and lots more. If you have the perforated steaming basket that fits into the pot, then you can also steam seafood, meat and vegetables. You can even use it for preserving and canning food, brewing beer. Yes, the turkey pot is indeed a very versatile kitchen tool. You can get it in aluminum or stainless steel. The 30 qt pot with spigot allows for an easy oil removal and cleaning procedure. What size turkey will a 30 qt fryer hold? Recommended maximum size turkey for the 30 quart fryer pot is 18 pounds. As for cooking time, estimate about 3 1/2 to 4 minutes per lb of turkey. Make sure the internal temperature reaches 165 degrees in the breast and 180 degrees in the thigh. You’ll need about 3 gallons of peanut oil for deep frying your turkey. The pot does come with a maximum fill line. With this Walmart complete turkey fryer kit, all you’ll need is a propane tank and your oil. Safety features include the flame sensor and the timer control system. If you do not wish the flame to go off after every 15 minutes, then make sure that you reset the timer just before the 15 minutes are up. This is a safety feature. This will certainly make you more alert to the turkey frying in the pot of hot oil. The pot can fit in an 18 lb turkey maximum. Expect to use about 4 gallons of oil. You do not get the convenience of a drain valve or spigot to drain your used oil. It measures 12.2″L x 12.2″W x 29.33″H. The 30 qt aluminum pot fryer set comes with a 90 day warranty. 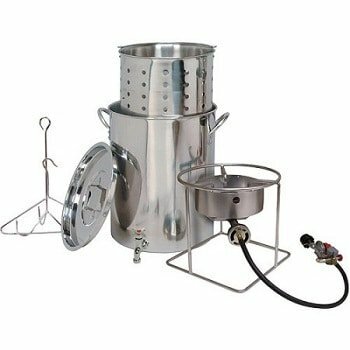 You’ll still need to get a gas burner and propane tank for this Bayou Classic whole turkey fryer stockpot set. This Bayou Classic aluminum turkey fryer pot measures 11.6″ in diameter with a height of 15.4″. The perforated turkey rack measures about 10″ in diameter at its base and has a height of 14″. It comes with 1 year manufacturer’s warranty. 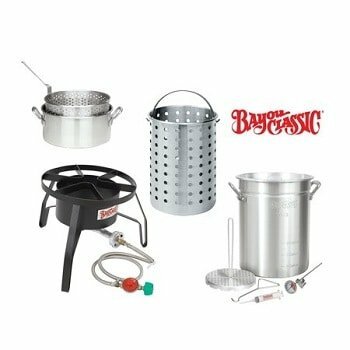 Besides this basic turkey fryer set with rack, you can also get a package with the perforated steaming basket and burner, or perhaps you prefer the basic set with an additional burner instead? This package comes with a stainless steel fryer pot. You’ll need to get your own 20 pound propane tank and oil. 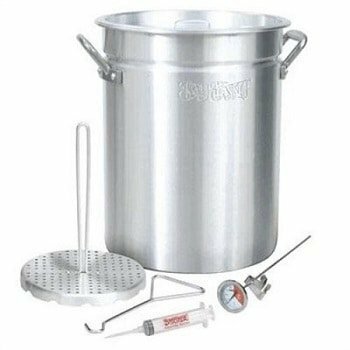 The assembled fryer set measures 13.25″ L x 13.25″ W x 27.50″ H.
The stainless steel pot has an approximately 11.5″ inside diameter and is about 15.25″ in height. The fryer pot doesn’t come with a draining spout or spigot. Basket is also not included. You’ll need to buy your propane tank separately. The 2 AA batteries for the timer are also bought separately. The pot with spigot makes it easy and less messy to drain the used oil for filtering and storage. This Masterbuilt propane turkey fryer kit with 30 qt pot doesn’t come fitted with a drain spout. Neither is a frying/strainer basket included. You can easily buy a basket if you need one. 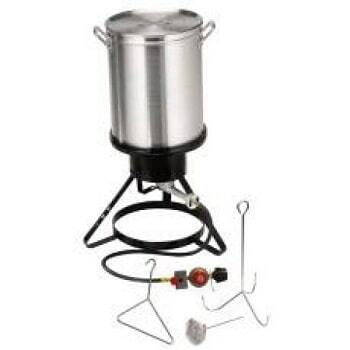 This 30-quart aluminum turkey fryer pot and lid comes with an automatic timer and an outdoor gas burner stove. All you need to buy is your gas. A 10 qt fry pot is also included. The fryer set comes in aluminum and cast-iron construction for high quality performance. The large steam/boil basket is great for boiling crawfish, shrimp and vegetables. Dimensions of turkey fryer set when fully assembled : 25.80″L x 14.00″W x 21.00″H. What Can You Cook In A 30 qt Turkey Fryer? Besides frying turkey, it is also great for frying chicken, fish, fries and hushpuppies. Try a crab boil, crawfish, crabs, shrimp, vegetables, pastas, soups, stews, gumbo, low country boil. Steaming lobsters work great too. If you enjoy brewing beer, then go ahead! But you might want to get the stainless steel stockpot instead of the aluminum one. 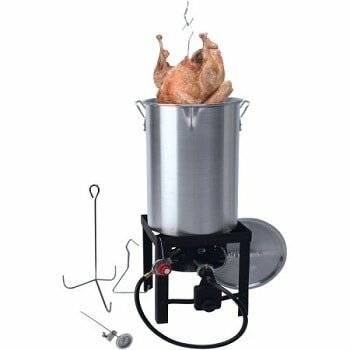 If you want it for brewing beer, then you might need to get a separate pot for deep frying your turkey. You don’t really want grease in your beer. Cooking a large batch of corn on the cob or potatoes for your party – you’ll love your the turkey fryer pot. Food canning works great too. Cooking outdoors with the large capacity turkey fryer pot allows for quick cooking of large quantities of food – perfect for gatherings and parties held at home. Remember to bring it along on your next camping or fishing trip. Place the tip of the thermometer inside the boiling water. The battery operated timer is designed to shut off the gas supply after 15 minutes. You’ll need to manually reset it before the 15 minutes is up for uninterrupted cooking. So, remember to press the Start Timer button every 15 minutes to stop the flame from going out. The fryer must be on a level, stable non-combustible surface. Make a 1-inch cut in the skin at the leg-thigh joints to allow for draining of oil when cooking is done. Put the turkey on the turkey stand or frying basket with its legs up. The tip of the leg bones can be exposed above the oil but the meat of the bird has to be completely covered. The lid should not be used when frying. Always make sure oil temperature does not exceed 350°F. Heating up the oil will take about 40 – 45 minutes. Always use the fryer in an open area with a minimum clearance of 10′ of space on all sides and no roof or overhang overhead. Place the gas tank at least 24″ away from the appliance. When frying is done, remove the oil only when temperature of oil has dropped to below 100°F. Never store used oil inside your aluminum pot as the salt and seasoning used can corrode pot. This can cause leaks in the pot. Yes, frying your turkey outdoors can be safe and fun provided you have the proper tools and follow the safety rules. 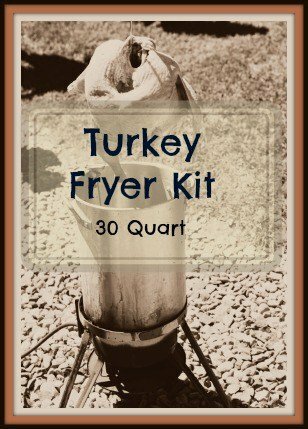 The 30 quart turkey fryer kit is not only great for backyard cooking but also for camping, fishing trip, tailgating etc.